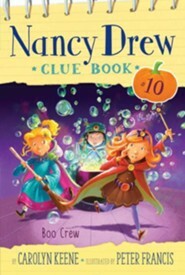 Help Nancy and her friends find the truth behind a haunted theater in the tenth book in the interactive Nancy Drew Clue Book mystery series. The hit TV show Twinkle Little Stars is coming to River Heights to audition contestants for their upcoming Halloween show. Theyll choose talented kids from all over the country to compete for prizes. Nancy, Bess, and George are dressing up as witches and are planning to create a special potion onstage for the judges. The recently renovated Heights Theatre has opened its doors for the auditions. The old theatre had been abandoned for fifty years but is now restored to its original beauty. But on the day of the auditions, everything seems to go wrong; the girls cauldron over bubbles, a werewolf mask makes its owner sneeze, spider webs fall on the dancers. Thats when the clue crew learns the Heights Theatre is rumored to be haunted—people say ghosts are the reason it stayed empty for so long. But Nancy knows better than to believe in ghosts. Shes sure that the culprit is of the human variety. Then Bess sees monsters dancing around a piano playing on its own—the keys moving but no is playing it. Could the rumors be true? Is the Heights Theatre really haunted? 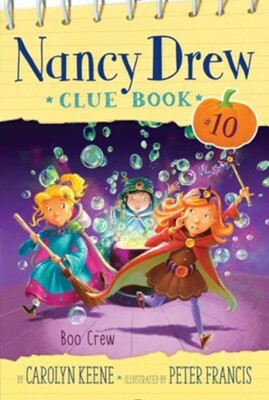 Its up to the clue crew—and you—to find out! Peter Francis lives in Brighton, UK, where he spent a number of years as an illustrator for childrens television before turning to books. When not painting in his studio, he enjoys long coastal walks, exploring local history, and growing vegetables. I'm the author/artist and I want to review Boo Crew #10.